Happy Friday! I don’t know about you, but wow, that week went by fast! A couple nights ago, Dustin and I went on a spontaneous date night without Wren. Dinner and then groceries… my, how the times have changed :). While in line at the grocery store, I decided to treat myself to the new Country Living Magazine. I was actually looking for this one, but they didn’t have it. This North Carolina home was one of my favorite features in the magazine (you can see my other favorite one here). The owners have done a great job ‘DIY-ing’ their entire house on a budget. That’s my kind of house! From full on renovations, to building furniture, to decorating. And it looks great! 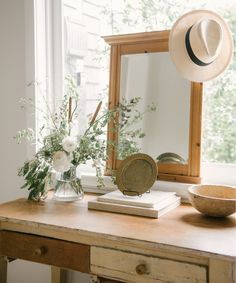 I love all the white walls with the natural wood tones. 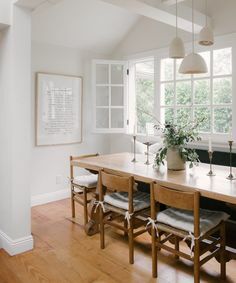 So airy and light. So, any fun plans for the weekend? We are having an open house on Sunday afternoon so we will have to find somewhere to escape for a few hours… I am thinking maybe some treasure hunting? We will see. Have a great weekend all! Good morning! Have you heard of the online magazine, Heart Home? I just discovered it via Holly Becker over at Decor8 about a week ago. They’ve recently released their second issue and it is full of great British interior design ideas and beautiful home tours. Their first issue is also worth a peak. If you’ve got the time, I would recommend grabbing a cup of coffee or tea and getting comfortable before you dive in. Enjoy! As I was busy flipping through the latest issue of Lonny magazine with my coffee this morning, I couldn’t help but be inspired by interior designer Lisa Sherry‘s home. She has definitely mastered the white, creamy, neutral look – she also has a healthy dose of black and animal prints thrown in – which keep things interesting. I am also loving the brightness of the white walls in this home. Most of the walls in my home are painted grey (a Benjamin Moore colour that I forget the name of right now)… I still like the colour, however I painted everything before I moved in and had I been living here already, I would have realized that despite having two very large windows (think sliding glass doors), how little natural light I actually get thanks to being north-facing. I probably would have reconsidered my paint choice for something far lighter. 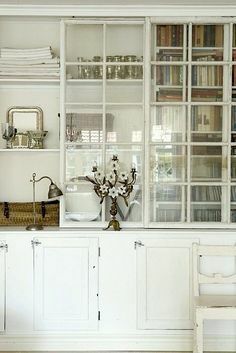 What do you think, could you have this much white in your home? To see more of this home, check out this month’s issue of Lonny Magazine here.